Backyard Wintertime Nature in New Jersey. Maple Syrup Week 3. Before going over to help with the maple syrup boil-down, I noticed a cat sitting under my patio bird feeder. While there a squirrel walked right behind it, and when the cat noticed — the squirrel got chased. It is not the same cat that I saw while starting the fire to cook down the maple sap. Last Day of Summer — Backyard Nature in New Jersey. There were a pair of garter snakes mating in a tree in my neighbor’s backyard. The female is the larger of the two snakes. He said they have be up there for at least a day. With all the rain we have had in the last few weeks, mushrooms are popping up all over the place. I’ll have to let the house trolls go out hunting tomorrow. Backyard Winter Nature in New Jersey — Spring is Near. Little do the Snow Drops and Purple Crocus flowers in a neighbor’s backyard know that another Nor’easter storm is predicted for tomorrow with 1-12 inches of snow and lots of wind. 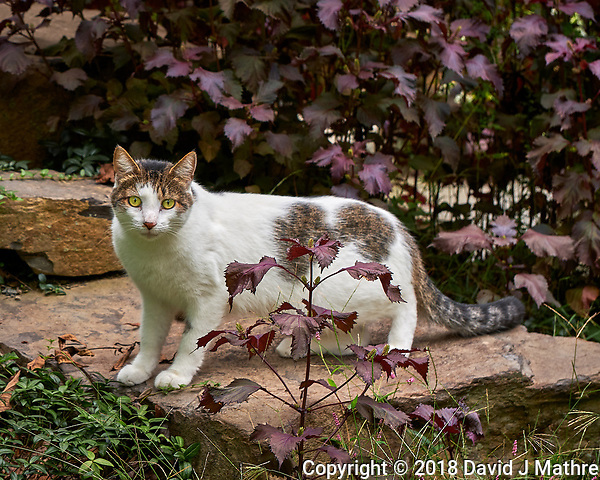 While photographing the flowers, a wary cat kept track of my every move.